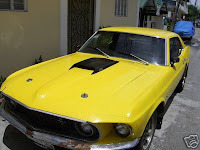 When my father was alive, he bought an old, beaten 6-cylinder 1966 Ford Mustang coupe with plans of restoring it. He and my brother set to work and had it appear as good as new. Too bad he didn't live long enough to be able to drive it around. There was still a problem with the alternator when he passed away. My brother worked doubly hard to get it fixed and I even pitched in some money for the repairs, just so that we can complete what my father started. And now, we're selling it. That's it, the blue car on the top picture. The reason why we're selling it is because my brother saw a V8 1970 Ford Mustang coupe (which was upgraded to a Mach1 by the previous owner) on the Internet, being sold by an American (or British, I'm not sure) who was leaving for the States to have an operation. His initial intention was to buy and sell it. So he borrowed money from my mother and together with an uncle, they went to Subic where the owner and the car was. The owner already prepared the necessary papers so that if my brother decides to buy it, they can already bring home the car. My brother inspected it to be good, and even found out that the registration is current. He paid the owner, signed the papers, and was able to drive the yellow car from Subic to Manila without any problems. Seeing that it's in very good running condition, plus the fact that it has a more powerful engine than our blue one, he decides that he's not going to sell the yellow car; instead he would be restoring it. And the money that he is going to use for the restoration and for paying my mother is the money he will receive by selling th blue car. He even justifies it by saying that my dad would have done the same thing, because he really wanted a V8 but just couldn't find any so he just bought the 6-cylinder (it was not color blue then, more of rusty-orange). And I do agree with that. Plus, after my brother restores the V8 and he decides to sell it, it would fetch a far greater price than the 6-cylinder ever could. But that's just the practical side of me convincing myself that it's ok to sell the blue Mustang. The other part of me doesn't want to let it go. My father bought and restored that car, and I remember he even intended to give it to me because he doesn't want me to drive a Japanese car that could easily crumple (with me in it) in case of collision. Sad to say, my father died, I'm driving a Mitsubishi, and we're selling our blue Mustang (I even have a name for it already, Lalaine). If I just have the money, I would pay my mother what my brother owes, pay for the yellow car's restoration, and keep Lalaine for myself. Then everybody would be happy. We want to get out of the rat race!